This exceptionally powerful moving-head spot is tailor-made for large events with its piercing, razor-sharp beam. Under the hood of the Intimidator Spot 375Z IRC is an intense 150-watt LED matched to dual rotating prisms that split the beam to create spectacular effects over a large area. 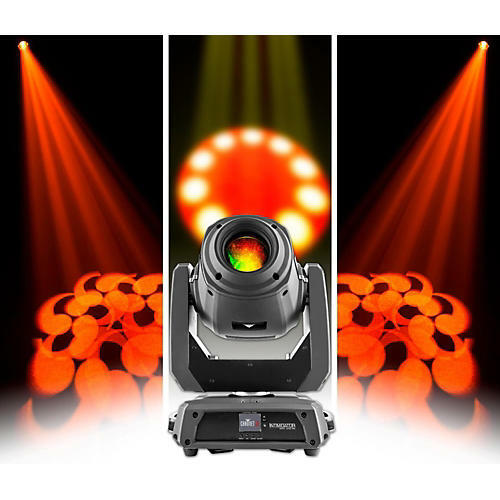 A motorized zoom adapts the beam to both short- and long-throw applications, while motorized focus ensures crisp projections at virtually any distance. The built-in totem mode stabilizes the beams exactly where you want them, and built-in operating programs let the Intimidator Spot 375Z IRC run automatically or in response to sound. For total creative control this spot can be controlled in DMX mode. Whatever mode you decide to use, this is one powerful tool for your next large event. Link several of these spots together for a dazzling, unforgettable lighting display.